The hike to the peak of Mount Ajo is both challenging and beautiful. The views of the surrounding mountains into Mexico along the trail and at the peak are spectacular. The lush vegetation in Bull Pasture and especially Estes Canyon added another dimension to this hike. These areas get enough water to support some of the healthiest organ pipe, saguaro and cholla cactus plants I have ever seen. Some chollas were 8 to 10 feet tall and looked like small trees. I have seen plenty of chollas but these were unusual. Going in we followed the Bull Pasture Trail all the way to Bull Pasture. Along the way there are views to the south to mountains in Mexico. This is a maintained trail that climbs from the trailhead at 2,350 feet to 3,250 feet in about 1.5 miles reaching the end of the official trail overlooking bull pasture where ranchers once kept cattle during the winter months. The pasture is rich with lush grasses and you can see why it is aptly named. At the end of the Bull Pasture trail there is a second sign-in post I assume is for those continuing on past that point. There is an un-maintained use trail from there to the peak about 2.6 miles long that is marked with rock cairns along the way and is not too difficult to follow. We climbed from 3,250 feet to the peak of Mount Ajo at 4,808 feet on this trail. There are several very steep sections with loose dirt and rocks that make it a bit challenging but ultimately doable. The reward is the spectacular 360 degree views from the top of the mountain ranges of Mexico, Organ Pipe and the Tohono Odham Indian Reservation. At the peak there is a large ammo sign-in box and a couple of low profile solar powered FM antennas. The antennas are not visible from below and only come into sight about a mile from the peak. Going back down is a slow process due to those steep sections and rocky terrain. When we arrived at the signed intersection of the Bull Pasture and Estes Canyon trails we turned right onto the Estes Canyon trail and returned to the trailhead this way. The relaxing return hike through Estes Canyon was very scenic. Some of the best cactus specimens were in this lushly vegetated canyon. Also there are some great views back up to the Peak of Mount Ajo. Sun_Hiker and I did this one on a Thursday starting at 9:00 AM and finishing at 4:30 PM. We went very slowly on the downhill part and neither one of us fell. Also we stopped numerous times for picture taking, something I'm sure that most will want to do. There are plenty of photo opportunities here. Mount Ajo is in the Organ Pipe Cactus National Monument. We drove from Phoenix to the Visitor Center on Wednesday afternoon and stayed in Ajo Wednesday night. There are campgrounds near the visitor center as well as in town of Why and a few places to stay in Ajo, 33 miles from the visitor center. The National Park allows backcountry camping. Stop in the visitor center to get the appropriate permits. Alternatively you could leave Phoenix at 4:00 AM or so, do the hike and return home the same day, but that's a long, long day and I don't recommend it. Stop in the visitor center located 33 miles past Ajo (22 miles past Why) on route 85 for a map and directions to the trailhead. There is an $8.00 charge unless you have a National Parks or Golden Age Pass. 1. The hike is almost totally exposed. The peak season at Organ Pipe (from their website) is November 15 to April 15. To avoid excessive heat, I would do this one November 15 or later to March 15. Avoid this hike completely during the summer months since daytime highs can exceed 100 degrees. And it will feel a lot higher than that with no protection from the sun. 2. 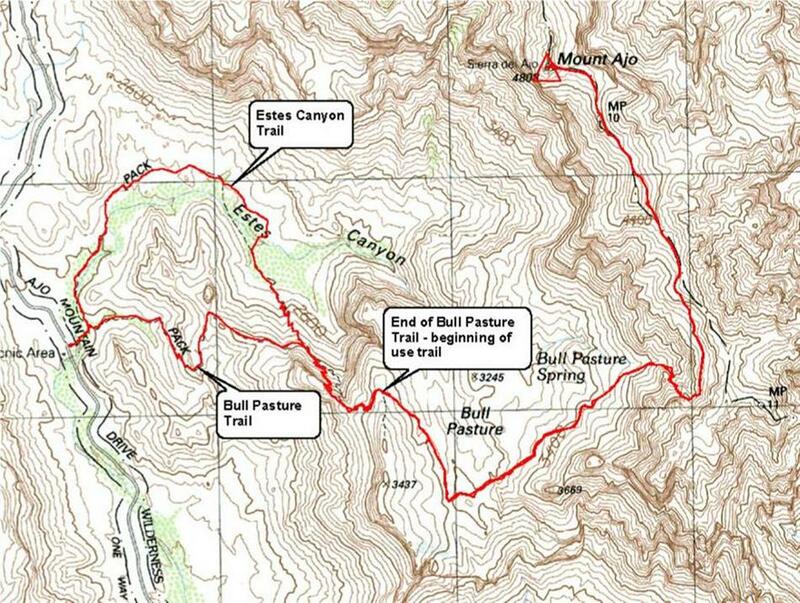 The first 1.5 miles on the Bull Pasture trail is good trail with a reasonable hiking grade. Then the use trail to the peak (not shown on the official map but adequately marked with rock cairns) becomes quite rocky with loose dirt and rocks and very steep in parts. This will slow your rate of progress significantly while hiking up to the peak and especially while coming back down. 3. This hike should never be attempted in the rain or when the trail is wet. If you find yourself there under these conditions you can do an alternative hike like the hike through Arch canyon up to the Arch. We went with a group to Organ Pipe in February 2005. It rained that day and we did exactly that. 1. Take I-10 east until you reach the junction of Hwy 347 south to Maricopa AZ. 2. Continue along Hwy 347 until it terminates at Hwy 84. 3. Take Hwy 84 west until you join I-8 west towards Gila Bend AZ. 4. When you reach Gila Bend, take Hwy 85 south towards Ajo AZ and the Mexican border. 5. Continue on Hwy 85 passing through the towns of Ajo and Why before entering Organ Pipe Cactus National Monument. 6. Obtain your day pass from the Visitor Center on the west side of Hwy 85, ~5 miles north of the Mexican Border. 7. Take the Ajo Mountain Scenic Drive 11.4 miles to the Estes Canyon Picnic Area and Trailhead.